For a long lasting make-up, Avril Organic Make-up Primer Base is a must-have in your beauty routine! It smoothes, softens, moisturizes, nourishes and mattifies your skin for an impeccable result all day long! Uncoloured product, it can replace your day cream. Its composition rich in floral water of organic Damascus rose, organic macadamia nut oil and organic jojoba seed oil naturally takes care of your skin. With the Avril Organic Long Lasting Complexion Base, your skin's appearance is smoothed! 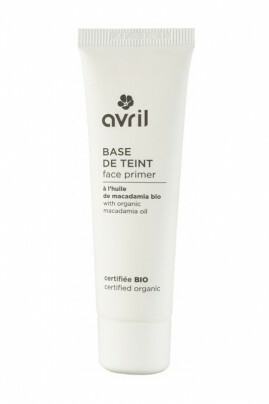 AVRIL Organic Moisturizing Primer Base is like a cream that smoothes your skin! The Avril Organic Complexion Base is applied before make-up and acts as a real moisturizing and protective day cream. Apply 2 drops of this base on dry skin with a finger or blender sponge. Let it dry and then apply your Avril organic foundation. The Avril Organic Complexion Moisturizing Base moisturizes your skin for a long time!